PK is 13 months old. His personality is an interesting mix between Bean’s laid back attitude and Plum’s feistiness. He has reached a phase where he is developing fast, and he is very pleased with his new abilities. His babbling has recently taken on more meaning. Much of it is still babble, but he is very earnest about whatever he is saying. He does say some words, his favourites being “hiya”, “kiss”, “ta” and “yes”. He says Dad a lot, although he can’t quite decide whether to call me “Mama” or “Mba” and seems to change his mind each day. Last week, he took his first steps. Just two. And then he did it again a couple of minutes later. And then, deciding that was quite enough of that he stopped. He’s done it a few times since, but crawling has remained the way he gets about. And then tonight, whilst I was napping on the sofa, I was woken by cheers from Bean and Stonelaughter. PK had just walked half way across the front room to his brother. It’s amazing to see him delight in his new abilities. It’s a bit scary at times too, since he follows Plum’s no-fear attitude and likes to climb on the chairs, the children’s table and anything else he can manage to reach. But he clearly knows that he’s in the midst of exciting times, and he likes to celebrate each achievement along with us. For me, it’s tinged with sadness too. 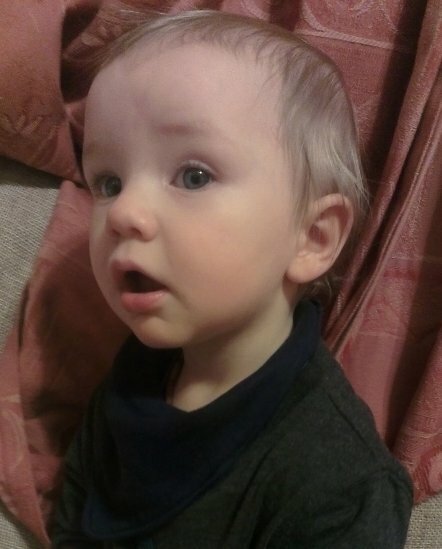 It’s an exciting time, but he’s my youngest child and he’s fast becoming a toddler. I won’t have any more babies, and I’d love to hang on to these baby days as long as possible. PK has different ideas, of course. He loves the increased independence he’s finding in his new abilities.